We’ve been delivering quality chiropractic care to the Asheville community since 2004. Everyone who has moved to Asheville always gets asked the question, why Asheville? After graduating from Palmer College of Chiropractic in 2004, Dr. Martin and I went on a road trip to North Carolina, Georgia and Texas. Before we left Iowa, people who knew we were going to North Carolina told us we had to visit Asheville. As we were driving across the Tennessee line we saw the sign for Asheville and decided to spend a day walking around downtown. We were immediately drawn to this lovely city in the mountains. 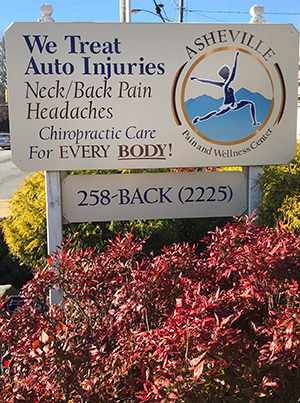 Within six months we found a great location in West Asheville and began our chiropractic practice. We are so thankful to be part of this wonderful community and delighted to call Asheville home. We have designed our clinic to be friendly, inviting and comfortable to our patients and staff and to be as efficient as possible. We do our best to run on time and keep patient waiting time under five minutes. Our vision is to be the best and most respected chiropractic clinic and chiropractors in Asheville, NC! A healthier lifestyle and sustainability is what we hope and dream about for our Asheville community. When you look at the disposal of medications whether through the local dump or through the sewer system it has been shown to take its toll on our environment. We would love nothing more than to see people in our community relying on medications less; because of the side effects of the drugs and the negative effects the pharmaceuticals have on our planet. Dr. Terri Lechner encourages patients to achieve the highest levels of health they can. Through educational opportunities (like this website), we hope to communicate the value of ongoing chiropractic care. Our desire is to see our patients abandon the prevailing sickness care model of health (waiting for symptoms and then taking action), in favor of the emerging wellness model. If you truly want to achieve a higher quality of life without having to rely on over-the-counter drugs and prescribed medications to control pain then contact our office to make an appointment today!